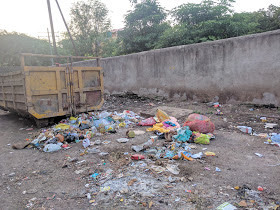 Aurangabad, October 14, 2017 : City garbage had already frustrated people of the city and in no time, even the residents of Naregaon have started complaining about the dumping done in the area. Heaps of garbage have been dumped in Naregaon and hills of garbage has been created in the area. This has resulted into the worst health conditions in Naregaon and people have finally raised a voice against it. “We have been living here since past 2 years but now, the problem has become a major problem for us because at first the dumping was not done in this amount but now, hills have been created and due to it diseases have been spread in the area.” Said a resident of Naregaon. 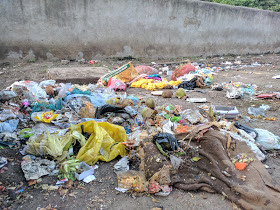 Complete heaps of garbage can be seen in the area and it is spread into a large area. Stray dogs too have created a problem for the people in area. Everyday huge amount of garbage is dumped and added into the heaps. Not only the residents residing but also the industrialists have started complaining about it as they have their own factories and shops around the “Mountains of Garbage”. City people are too fed up because of no bifurcation made between dry waste and wet waste as well as the collection of garbage is not being properly practiced in few areas. People have filed complaints in Aurangabad Municipal Corporation but still no response has been given to the people. The most affected people because of garbage are lower middle class families and middle class families as they have their home in such areas where proper care is not being taken against garbage collection and dumping. “We hardly see that the garbage is being collected properly and disposed at a proper place. In-spite of repeated recommendations for bifurcation between wet and dry waste, no action has been taken and that creates a lot of problem for we people who live in the area.” Said a resident. Records show that cases of some diseases have been reported in very short span of time and we can say that it is only due improper garbage collection in that area as there is no other way for that disease to repeatedly occur in the same manner. This has now become a sensitive issue for the common people and the city as well because it is directly affecting the health of people and hence some strict actions shall be taken against it.